I would like to talk about the importance of cleaning the exterior of your Home prior to painting. The most important fact is that cleaning the exterior means your exterior paint will last longer. Contrary to what other Contractors will say, the paint will not immediately fall off if you don't clean before painting. The paint will apply fine and it will adhere. It will also look good. But the problem is that it just won't last. By painting over dirty surfaces, you seriously shorten your paint's lifespan. Considering how expensive it is to paint a home exterior, it probably would be a wise idea to do the job right the first time. 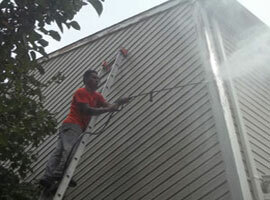 Davinci's Painting always includes power-wash cleaning on every Exterior that we service. It does take an additional day to go through this process, but the extra time spent thoroughly cleaning the siding will increase the lifespan not only of the paint but the wood trim as well. The real purpose of pressure washing your Home prior to painting is to clean away dirt and mildew. The second purpose is to remove peeling paint, or where paint that has otherwise failed. Although the power-washer does help a lot in the removal of failed paint, our Painters still go through the preparation process of scraping and sanding. 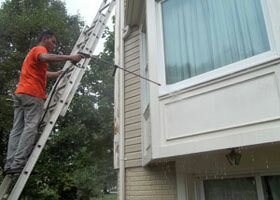 We also power-wash all other non-painted surfaces, such as: aluminum or vinyl siding, brick, gutters and downspouts. Clean the Entire Space: Powerwash from the top down without any cleaning solution. Your intention is only to knock down the big gunk: spider nests, inactive wasp nests, leaves, and the majority of the dirt. Clean With Solution: Let dry and then do this step when the siding is not in direct sunlight. Next, fill up your pressure washer's tank with bleach or TSP. Powerwash with the water-solution mixture from the bottom of the siding to the top. Let soak for about ten minutes. Rinse with fresh water from the top down. Second Fresh Water Spray: If a couple of weeks pass before you can get to painting, I advise an additional spray-down with non-potable water. It's surprising how fast spiders can move in after a cleaning. When Homeowners think about painting around furniture while working within an interior room that is occupied it's probably necessary to move all of the furniture away from the walls of the room. This may or may not be very helpful. Think about a Bedroom or Living Room. If you move all of the furniture to the middle of the Room, you have created a huge obstacle to paint around. When painting a ceiling with the proper equipment like extension poles, an obstacle in the center of the room is hard to work around. This is not an obvious issue if you are only providing application to walls only. Davinci's Painting recommends that furniture be moved away from walls and arranged with a few pieces in different areas of the Room. The furniture should be spread out within the room rather than isolated to s single place in the center of the room. This generally makes it a better and safer work environment. If the Homeowner is moving the Furniture, it is suggested that you leave enough space between spaces of furniture and the walls in order to provide space for an average step ladder. When moving furniture, we suggest following safe lifting techniques. Many back injuries happen to people who are moving furniture. If at all possible, hire a Moving Company that has experience in moving or dismantling large furniture pieces. When Davinci's is requested to move furniture, we take extra precautions to ensure that no accidents occur. Smaller light weight pieces of furniture can usually be picked up and moved ahead of time by the Homeowner. However, heavier pieces could require several men to move to an ideal place in the room. Homeowners, should be careful not to scratch or cut any wooden or tile floors. This is also true for carpet. Pushing or sliding heavy pieces of Furniture across carpets can tear or stretch the carpet, creating lumps in carpet. To avoid damage to any type of floor place a large piece of cardboard under the furniture and slide the furniture across the cardboard. This will protect the carpet. For certain very large projects, we request that the Homeowner retain a Moving Company in order to clear out the working area. One should also be very careful with any electrical appliances or outlets in the room. You need to turn off the circuit breakers for the outlets in the room you are working on to avoid any hazard. Latex paint contains a lot of water, and everyone knows that water conducts electricity. Sometimes you may need to turn off more than one breaker for one room. A foolproof way to see if an outlet is off is to use a circuit tester. Circuit testers consist of two wires that are connected to light. If you plug the circuit tester into any outlet and it lights up, you will know that you did not turn off the electricity correctly. Once the electricity in the room is off, it is safe to remove the switch plates and outlet covers to be sure not to get any paint on them. Place all of the screws in a secure place to be sure to they will not be lost. Davinci's takes extraordinary efforts to cover all of your floors and furniture with plastic sheathing and drop cloths. Plastic sheathing will generally suffice for Furniture, however, floors usually require a larger thickness plastic sheathing, as well as, drop cloths. The thinner plastic is only ideal for furniture and not designed to be walked-on because often times the thinner plastic will tear easily. Homeowner's do appreciate the level of protection that Davinci's Painting provides for it's Customers. When saving money is the goal of a do-it-yourself Painting Project, every purchase for the Job needs to be an intelligent decision, so homeowners often wonder, "Do I need to prime this wall before I paint it?" Primer is not always necessary, so you can often save money by omitting it. In many cases, however, primer will actually save you money because it reduces the number of more expensive topcoats you will need to get excellent results. New Drywall & Skim Coating: The process of drywall installation and/or skim coating leaves a great deal of highly absorbent space to paint, and it may require many coats of high quality paint to give adequate coverage. Use a coat or two of quality primer first, however, and the pores will be sealed and your new topcoat will cover nicely in one or two coats. Patched or Repaired Drywall: If you have repaired a wall before painting, you will likely have patches of Spackle or joint compound on the surface. If these repairs are small, you do not need to buy a separate primer; simply use a small amount of your regular paint and brush it lightly on those areas to "spot-prime" the wall. Then, when these spots are dry, you can paint the wall normally and those spots will not show through. Major Change in Wall Color: Painting contractors generally assume that a dark color will cover over a light color very effectively with one or two coats. Light paints, however, will rarely cover dark colors even with many coats. In order to save money and time, professional painters recommend using a good primer with strong "hide" qualities. Painting over Oil-based or Glossy Paints: In order for the new paint to perform well, the new paint must have a surface it can adhere to. When the current layer is oil-based or has a sheen, this surface can be acheived in two ways. You can use sandpaper or TSP to scuff up the surface, or you can apply a bonding primer which will stick straight to the under-layer and provide a good backing for the new paint. If you need to prime anyways because of color change, then use this method and skip the sanding. If you don't need to prime anyways, however, it will probably be cheaper and faster just to do the scrubbing. Stain or Odor Coverage: Some stains, such as greasy spots or crayon scribbles, will show through new paint. Also, cigarette smoke and other strong odors can still be detected after repainting. In order to truly block out the ghosts of these issues, painting contractors use a serious primer like Kilz or Zinsser. Note: do not use a primer to hide mold or mildew in your walls. It will only grow. Instead, first deal with the cause of the mold (usually water entry), and remove the mold. Then, you are free to prime and paint. Many professional painters use a tinted primer before painting. This is an inexpensive way to bring your walls close to their final intended color before adding the more pricey topcoat. Ask about this at your paint store if you are painting a bold or dark color. Davinci's Painting offers excellent residential painting services in Northern Virginia and Washington DC.